60mins: congestion to mildly up. pivot level at 812. Low significance level. Lower time frames indicate still some slight upward bias to 812, 820, and possibly 828(stronger MM + Fib), but current pivot level (812) is still very much valid. MTFS is a little hesitant and Entropy is fading fast. 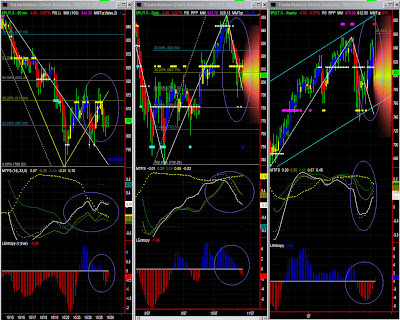 Market direction: congestion to mildly up if support is confirmed. 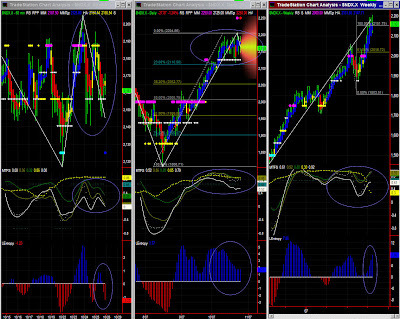 Lower time frames indicate some upward bias, and SPY could well reach Fib PR1 or even 153 (MM+ Fib). MTFS is not looking too bad but Entropy could peak shortly. Significance level is very low. Contrary to lower time frames, the daily chart still points downward, and this is the dominant time frame. One may have some congestion since we have Fib + MM level at 150. Caution must be exercised, at least until a new Fib formation appears clearly.For the time being, a strong base for support must be found to reassure the market. 150 is holding well overall for the time being, and low intraday time frames are in a cycle with some upward momentum indicating difficulties going higher. Check PR1 and pivot level on 60 mins chart to possibly release energy on the upside. Entropy is looking OK, but MTFS indicates continuation of this situation of congestion. The Swing indicator is very undecisive, so one may just be close to a key level. Volatility is very high, possibly confirming our earlier diagnostic that we may be close to a key level. The market is so overbought that a correction would be healthy. We have to note that the swing indicator has turned down for both dominant time frames. The market is both resilient and very volatile. Lower time frames seem to point slightly upward in the same trading range. 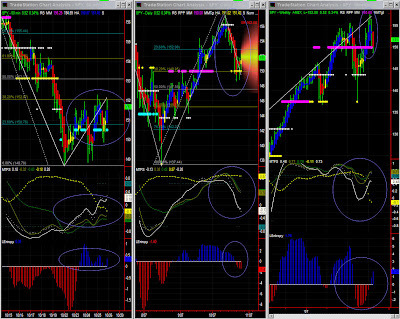 The 10mins chart show vergy good looking cycles. The up potential is however limited.It is too early to project Fib expansion patterns, but we would like to make some sense of the current congestion. The trading range is a little narrower, between 2156 and 2188. NDX is overbought, and each retracement so far has failed. Entropy is however declining, so one may just try and reach 2250 (or stay at prior stall level around current highs). MTFS green line holding well, so even if a strong retracement is expected it is nowehere visible in our indicators right now. Entropy is looking good, but MTFS has difficulty adapting to such a strong run (U-shape pattern is not closing). We therefore have 'waves in overbought zone' which may justify looking at a higher time frame. It seems we're entering a period of congestion.